Perhaps I am hungry today – but I have to confess – these scones make it on to my ‘top pick’ list. Sitting out in the courtyard rather than on the enclosed deck of the cottage, is the best way to capture a bright and clear autumns day. Although the waitress is run off her feet, the delectable scones arrive fairly promptly. They are piping hot; slightly crispy on the outside and soft and fluffy on the inside with a distinct creamy texture and flavour. The cream is whipped to perfection – thick and rich, which leaves the typical supermarket jam the weakest link. I could easily devour a second serve as they are ever so light and more-ish. The cafe also has a definite ‘older’ adult feel to it and is extremely popular so make sure you book for meal times. Don’t forget to have a browse through the small plant nursery out the front and there’s also some local jam and Mudgee honey for sale. There’s a 10 per cent price hike on weekends and public holidays, but it’s already factored into the prices on the menu. Tea: A range of loose-leaf teas served in a good-sized pot. 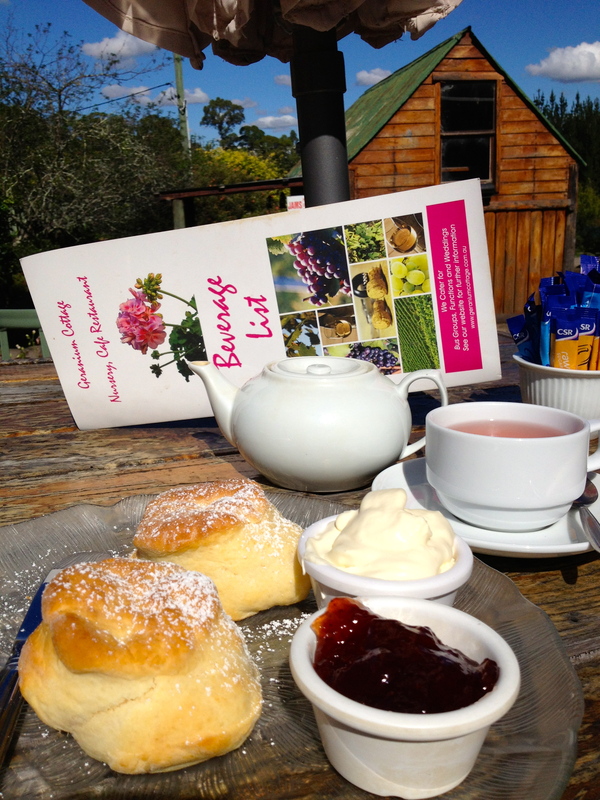 Overall: Some of the best scones in Sydney!